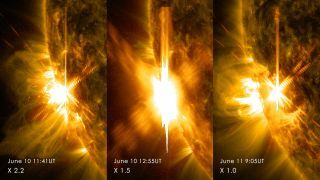 Three X-class flares erupted from the left side of the sun June 10-11, 2014. These images are from NASA's Solar Dynamics Observatory and show light in a blend of two ultraviolet wavelengths: 171 and 131 angstroms. The sun is supposed to be at the height of its 11-year activity cycle, but for the most part things have been pretty quiet. That might be starting to change, however. The sun unleashed a series of three huge flares last week. Scientists are dubbing the sun's exploits lately a "mini-max" because the maximum period of activity is shorter than usual. Today the sun is a pretty active place. Sunspots are popping up all over and lower-density areas ("holes") are appearing in the sun's corona, or superheated envelope of gas that surrounds our nearest star. You can watch a video about the sun's "mini-max" to learn more about the current Solar Cycle 24. The sun's bizarre peak has its roots in an odd time in 2008 and 2009, when sunspot numbers were far lower than scientists expected. Solar flares, which are associated with sunspot numbers and the sun's magnetic activity, also fell quiet. This situation demonstrates how hard it is to forecast a solar cycle. The average is 11 years, but it can take between 9 and 14 years for the sun to go from quiet to maximum and quiet again. Sometimes the cycle breaks, such as the infamous "Maunder minimum" that happened for 70 years in the 17th century, when few sunspots were visible. While this cycle is not quite that bad, it's still a weakling. "This solar cycle continues to rank among the weakest on record,"stated Ron Turner of Analytic Services Inc., who is a senior science advisor for NASA's Innovative Advanced Concepts program. Cycle 24, he added, is one of the weakest in the 23 cycles since 1755. The solar cycle is expected to start fading in 2015, but it will likely go out with a bang. Historically speaking, there are strong flares and plenty of auroras on Earth at the end of the solar peak, as particles from the sun strike our planet's magnetic lines and excite gases in the upper atmosphere. This also means that Earth's systems could be weakened by a solar storm, scientists cautioned. In 1859, a storm known as the "Carrington Event" was so powerful that telegraph offices were set on fire and auroras were spotted as far south in Hawaii. A similarly sized cloud of plasma (known as a coronal mass ejection) blasted from the sun on July 23, 2012, but it was fortunately aimed away from Earth. NASA said if it had struck our planet, power grids and satellites would have had "significant" damage.